iOS and Android devices have taken over the asset-tracking enterprise. Everyday, developers create new revenue-generating services for these platforms. They are tracking, validating, authenticating, and collecting data in new ways. Why are iOS and Android devices so convenient? Because deploying purpose-built computers to every worker is a logistic nightmare. It’s also prohibitively expensive. However, codeREADr’s SD PRO camera scan engine for both the Android and iOS barcode scanner is revolutionary. Workers can freely download the codeREADr app to their own smartphones. Then, they can enter their authorized app credentials. Finally, they can scan on behalf of their employer or client. Everyday over, 10,000 app-users do just that. They mostly use their own devices, though some use provisioned devices. The roadblock for data capture was performance. Using just the device’s built-in camera wasn’t satisfactory. In that regard, CodeREADr’s SD PRO camera scan engine has been transformative, for both the Android and iOS barcode scanner. Take UID tags printed with standard or inverted DataMatrix barcodes (examples). The typical app reads them quite slowly and inaccurately (if at all). 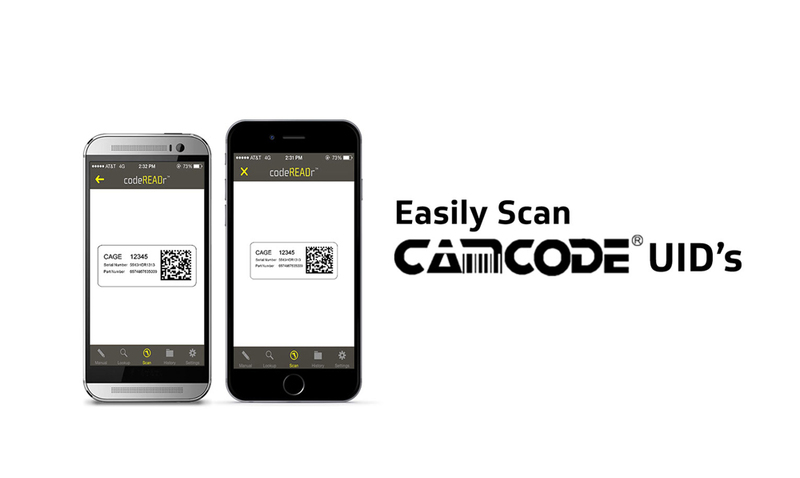 However, thanks to the SD PRO camera scan engine, our app reads theses codes for both the Android and iOS barcode scanner INSTANTLY. We scanned sample UID tags manufactured by a leading supplier, Camcode. Watch this short video for a demonstration. There is another added benefit. CodeREADr’s integrated cloud-based Web service offers the ability to alter scan values and responses in-app. It also lets users alter how data is exported (in a template). Simply put, the scanned data from a UID tag can be formatted however clients need it. That data can be merged with lots of information: Timestamps, GPS coordinates, photos, or textual data collected at the time of scanning, for example. Those scan records can then be filtered, shared, exported or inserted into local or cloud-based databases hosted by third parties or clients. What makes codeREADr’s SD PRO camera scan engine special? a) Speed: Decoding is measured in tens of milliseconds with many devices. b) Accuracy: Accurate decoding is essential. c) Versatility: Handling ‘exceptions’ is absolutely critical for seamless deployments. Scan virtually all commercial barcode symbologies. Download the codeREADr app (on your phone or tablet). Optimize scanning by selecting one or more the barcode symbologies.